A septic system will serve a home satisfactorily only if it is properly designed, installed and adequately maintained. Even a sound system which does not have proper care and attention may become a nuisance and a significant expense.” Protect your septic system to avoid major problems and hassles. Be careful what you flush down your toilet or put down your drains. Feminine products, tissues, and other non-degradable items should be appropriately disposed of into the garbage. To avoid septic tank and drain field problems limit the use of garbage disposals. They add too many solids and strain the capacity of the system. NO grease should go down the drains. 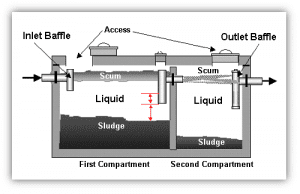 Grease is the most significant burden on the proper functioning of a septic system. Daily use of harsh home care products destroys biological activity in your septic system. Try to avoid these and use as many environmentally friendly home care products as possible. One company here in the Pacific Northwest, Biokleen is devoted to developing and selling bio-friendly products, but you also need to think about the amount of salt in the products you use. Liquid laundry soap is always a better choice over powder when it comes to septic tank maintenance. Septic lids (covers) should be watertight and at grade for service access to the tank. Install risers with safety nets for better access to the tank and less landscaping damage during regular cleanings. Cleanouts or air tubes should be installed to inspect the drain field visually during regular cleanings. This also allows for better access when treatments are needed for the drain field. A properly balanced biomat in your drain field is necessary for your system to help clean the effluent properly. If a bio-mat is out of biological balance, it will cause a backup. In most cases treating a drain field, every few years can alleviate drain field and bio-mat problems. Regular cleanings and inspections. Rely on your septic professional’s expert advice and experience in how often you need to pump out or clean your septic tank and drain field. Clean your septic tank filter more frequently than you tank cleanings. It is recommended to clean your septic filter at least annually. Treat your system monthly with our waste and grease digestant to provide high levels of biological activity within your entire septic system. Pollutants from a poorly functioning system can be drawn into your well and come out in your drinking, cooking and bathing water. If your tank and filter are not cleaned regularly, sludge and scum will clog the drain field and cause the whole system to fail. It is very important to remove the solid material before it reaches the level of the discharge outlet and flows into the drain field. There is a certain amount of material that is not biodegradable and must be removed by pumping. It is also important to clean your filter, so your system will not back up and cause a potential health risk. These are easy to do. Maintaining your septic system is less costly than a failure will be. These recommended practices could save you a bunch of hassles and thousands of dollars in repairs. Drain Doctor is here to help you with your septic tank maintenance needs. Call us at 503-630-7802.